Part of recreating Havana in 1958 has been my research into the Mafia's involvement with legalized gambling in Havana. 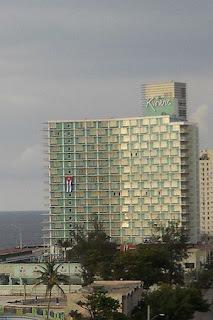 One scene in my new novel takes place at the Hotel Havana Riviera, a 352 room, 21-story creation of Meyer Lansky that opened in December 1957. 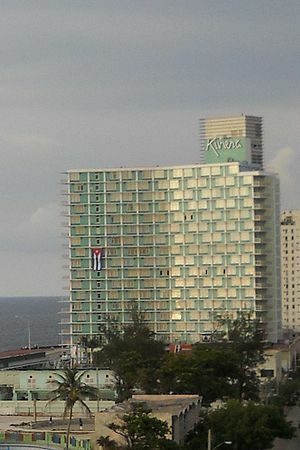 It was the first hotel in Havana to have air-conditioned guest rooms. The entrance was a work of art with an enormous white marble statue of an intertwined mermaid and swordfish. The marine theme was found throughout with murals by Rolando Lopez Dirube. Walls were covered in gold leaf and the roof tiles were blue like the ocean it overlooked. Abbott and Costello appeared onstage in the showroom and Steve Allen filmed an episode of the Steve Allen Show for broadcast. Lansky's partners included Moe Dalitz, Morris Kleinman, Sam Tucker and Wilbur Clark, an owner of the Desert Inn in Las Vegas, Edward Levinson of the Fremont Hotel and Hyman Abrams and Morris Rosen who had interests in the Flamingo after Bugsy Siegel had left the scene. In reading this blog I couldn't help thinking about the scene in the "Godfather Part II" when Michael Corleone is in Havana discussing with Roth the taking over of another casino in Las Vegas. It is Batista's New Year's Eve party and when Castro and his guerilla's storm the city, they are all forced to flee. Havana was a tropical paradise for the rich, and that definitely included the Mafia at that time. When I was a little girl in the 50s, my mother would take us to the Malecón on Sunday evenings to see the sun set. She would park her car and we would watch for over 15 minutes until no sign of the sun would remain. Although I had seen it before countless times, it was always different. Through a little girl's eyes it seemed magic. She would then drive to the end of the Malecón and I would look in awe at the entrance of the Havana Riviera. The sculpture mentioned in this post and the fountain. The sea blue color of the tiles evoked every time my love for the sea.